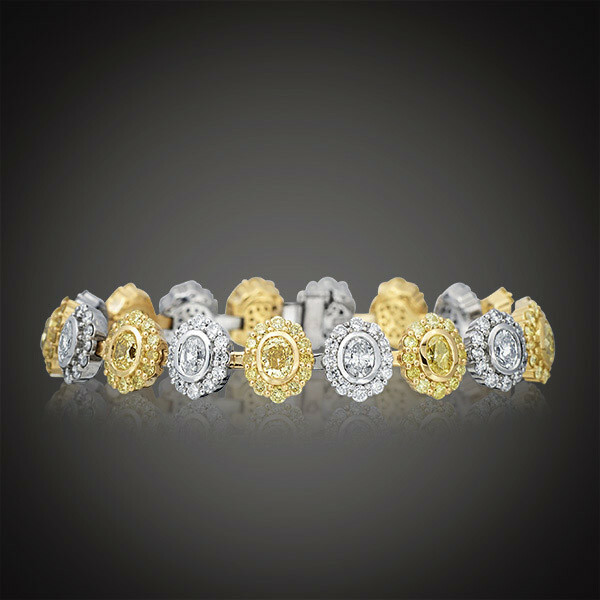 This one-of-a-kind bracelet from JR Dunn Jewelers' in-house designer, Robert Pelliccia, is a stunner! With alternating flower links, one flower design is strictly white with gorgeous white diamonds set in a flower pattern in 18kt white gold while the other pattern showcases fancy yellow diamond flowers set in 18kt yellow gold. These flower links alternate to form a beautiful two-toned bouquet that spans your wrist, and it's a Robert Pelliccia original.